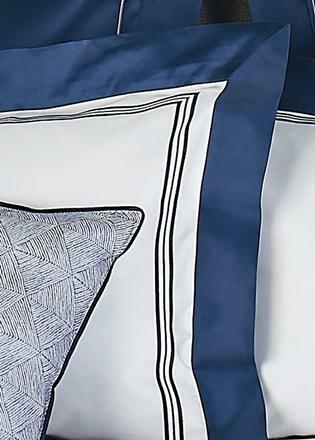 Marseilles collection, part of Heirlooms’ extensive range for sea, land and air. Heirlooms is a family-run British company that produces luxury, fine linen products and can count the British royal family among its loyal fans. Its bespoke bed, table and bathroom linens have been supplied to some of the ocean’s biggest superyachts as well as luxury residences spanning the globe. 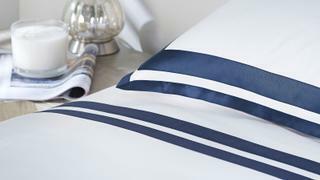 The brand was founded in 1984 with the aim of producing luxurious quality linens that stand the test of time. From here on in, Heirlooms vowed to use only the very finest materials and practise traditional craftsmanship, rather than cutting any corners in the processes used. Heirlooms’ reputation speaks for itself, having some of the most famous clients in the world. Most notable among them are a number of members of the British royal family, an accolade that came about after the company was granted royal warrants from Her Majesty The Queen and the Prince of Wales. But the prestigious connections do not end there. Heirlooms also has long-standing relationships with leading yacht builders, jet manufacturers, interior designers, property developers and boutique hotels. It has worked on yachts including Maltese Falcon and Exuma, and created linens for luxury property developments across the globe, from London to Morocco, Rio de Janeiro to Azerbaijan. Part of the reason for the brand’s undisputed success comes from its commitment to using only the finest Italian-woven fabrics and its refusal to move away from traditional manufacturing techniques. Heirlooms lives by the belief that, even with today’s technology, there is no substitute for the craftsman’s hands, eyes and instincts. Therefore, the highly skilled designers, cutters, machinists and embroiderers – who have a deep understanding of how the materials work together – personally measure, cut, stitch and check each item. Handcrafting linen ensures that all pieces are as individual as possible, but the company goes one step further than this in the name of all things bespoke. Briefs given by clients are entirely flexible – some are finished designs complete with colour schemes, while others bring vague ideas and the details are ironed out through a collaborative process with the designers, allowing clients to be as hands on as is desired. There is no one-size-fits-all policy, the designs are decided to the exact requirements of the client, no matter how extravagant or unique they may be. Aside from offering a distinctive customisation service to every customer, one of the most obvious attributes that sets Heirlooms apart from its competitors is its commitment to its customers in the long term. Detailed records are kept of every piece that has ever been made, including templates of mattresses and tables, so if the customer ever requires extras or replacements, they are easily to hand. Heirlooms’ huge range of products includes bed linens, towels, tablecloths, dressing gowns, tray liners, quilted baby blankets for cots and countless other accessories. 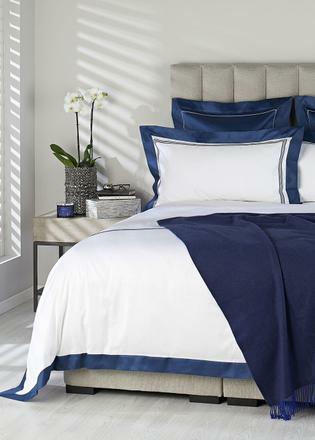 As well as a huge range of design and colour options, there are also numerous materials to choose from, including pure linen, cotton sateen, cotton percale and cotton pique. All are woven in European textile mills and then shipped to the Heirlooms workshops in West Sussex, England, to be lovingly handmade into whatever design the client desires. With a strong and trusted reputation already behind it, Heirlooms continues to be a leader in the linen market, with its sights set on being a part of yet more interesting and unique projects on some of the world’ s most impressive residences and superyachts.